Note the fine serrations along the leaf margins. At lower right is an outline sketch of the Mourning Cloak butterfly. 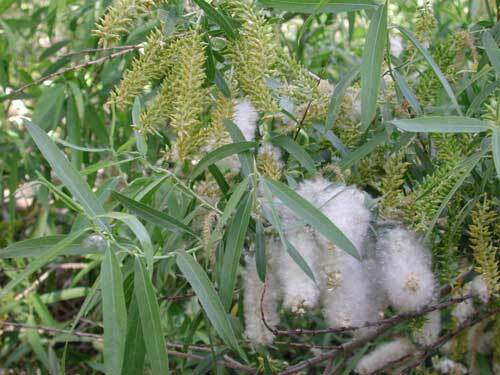 Downy fluff bursts from the fruit capsules upon maturity. There are many, long, fine hairs attached to each seed that will aid in their dispersal by the wind. TREE: Medium to large deciduous tree of riparian habitats. RANGE: Common along streams and rivers in the Sonoran Desert of Arizona and Sonora. Riparian habitat area in the Sonoran Desert is shrinking and what's left is being adversely impacted by human activity and exotic, invasives such as tamarisk. FRUIT: 0.5 cm capsules burst open in early to mid spring releasing numerous comose seeds. FLOWERS: Green flowers are in catkin-like spikes. 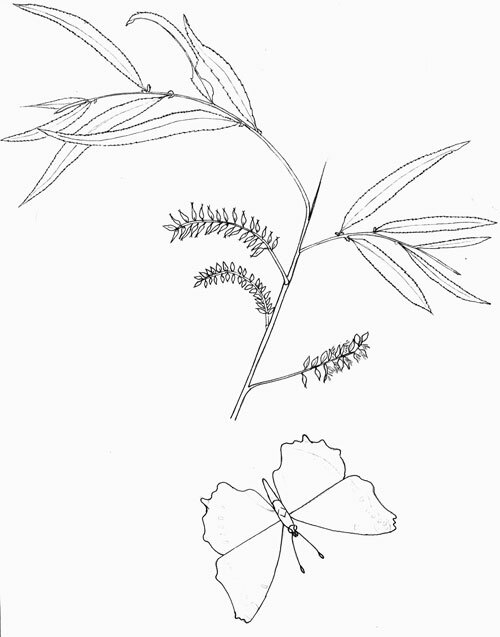 LEAVES: Alternate leaves have serrated margins. The caterpillar stage of the Mourning Cloak (Nymphalis antiopa) feeds on the leaves of Goodding's Willow. The adult butterflies can be seen on the wing in Arizona's riparian habitats in early spring to coincide with fresh new growth. The wings are a rich purple-brown with a cream-white border. By summer the willows leaves grow tough and bitter and are then no longer palatable to the caterpillars. 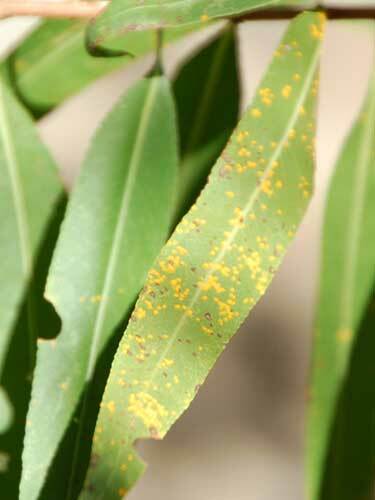 The bright yellow-orange spots on these leaves are a Basidiomycota rust fungus, probably Melampsora. Observed along Cave Creek, Spur Cross Ranch Conservation Area, Maricopa Co., Arizona, USA on 10 Nov. 2011.